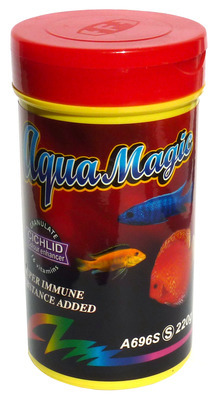 Suitable for Red Arowana, Cichlid and other medium sized tropical fish. Use natural colour enhancing elements such as Astaxanthin, Spirulina, Fresh Shrimps and ferment colour to help your fish develop it's natural bright colours within 7-14 days. Special immune substance and multivitamins, enzymes and other important elements such as organic minerals, trace elements and special amino acids are added to ensure balanced growth and�disease resistance. High quality control helps to keep a cleaner and stable water environment for your fish. Ingredients: White Fish meal, Wheat Flour, Antartic Shrimps, Soybean meal, Wheat Germ, Dried yeast, Immune Substance, Spirulina, Organic Minerals, 16 Vitamins and Natural Colours.